We really appreciate it that Paradox Interactive and GamersGate supplied us Sword of the Stars: Born of Blood for review. 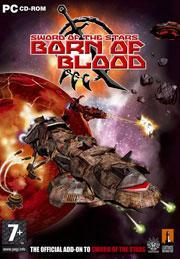 Born of Blood is the first expansion pack of three for the turn based strategy game, Sword of the Stars. In this game, you and up to seven other players explore the galaxy, expand your empire, exploit resources, and exterminate your enemies. This is sometimes called a \'4X\' game. Each turn, you manage each star system by choosing what to build, and how to allocate its resources. There is also the ability to research new technologies, design your own ships, manage fleets, join or break alliances, trade with other factions, or other actions depending on what ships are at a location. You can also issue commands for ship movement. If ships from non allied factions meet, at the beginning of the turn there begins a combat phase, which takes place in a real time, pseudo-3D tactical view. Kerberos Productions, unlike many other developers, takes a serious interest in their fan base. They setup the official Kerberos Productions forum (accessible here: http://www.kerberos-productions.com/forums/index.php ) and take real feedback from their players. After many patches to Sword of the Stars, they released the first of three expansions not only making the improvements that they had planned on, but also implementing player feedback. As a result, this expansion solves some of the issues the original had, while adding more content, like the Zuul. The Zuul are the new race of Born of Blood. This additional race plays much differently than the Humans, Hivers, Tarka, or Liir, while borrowing some elements from them. Indeed, one of the defining aspects of the Zuul is that they \'borrow\' almost all of their tech – they capture and enslave their enemies. They are in a real sense a plague on the galaxies they inhabit, and treat every resource they collect as expendable. They damage everything they come in contact with. They overharvest every world that they colonize, causing permanent damage to the resources of any world, while getting what is there more quickly. Their concept of a \'home world\' is in name only – they get no benefit from it unlike other races. Like the humans, they also use node space for travel, except they do not care for whatever nature has decided – they literally rip a hole in node space, making their own node lines as desired. Since the universe heals itself, they have to re-rip node lines, if there is anything of value to go back to when they are done with it. Defense is not important to them, but offense is very important. Their ships look like random pieces from other ships, and that\'s what they are, according to their back story. It\'s a very interesting, and difficult race to play, requiring much different tactics than the other established races. Other additions include trade and diplomacy. I really like both improvements, though trade can greatly affect economic growth. Each galaxy is divided up into trade sectors. Each sector is made up of several planets, usually around three to five. Once a sector is secure, you can build freighters which will trade with all nearby planets, bringing in additional income. You can also introduce commerce raiding, as well as freighter escorts to prevent such raiding on your trade routes. I found that it really helped my bottom line quite a bit, and was well worth the investment in freighters. Diplomacy is much better here, though I feel there is still potential for improvement. You can now not only offer to join a non aggression agreement or form alliances, but you can also make that alliance work for you. You can ask your alliance members to help defend any planet, or to take offensive action on an enemy. This works great because it makes coordination so much easier, and AI can be involved as well. I have found that the AI will ask for my help with their difficult situations, and I can ask for help with mine, and they will send it. It\'s also a great way to improve relations between factions. Another area of improvement is additional technologies. There are some great new weapons, including corrosive missiles, which leave an area of affect damage in the way, plasma cannons which are a rapid fire weapon, and plasma projectors, which create a storm of energy blasts at a target. There are also the armor piercing rounds, which makes a more accurate version of the mass driver. In addition to this, there are cloaked mines, improved forms of armor, and other goodies. There are also new torpedo defense platforms. All in all, a noticeable improvement in the available arsenal. I noticed that several menus have been reorganized, to make them much easier to use, or to add the new features. I also noticed that the general battle graphics have been souped up quite a bit, especially the weapon effects and explosions. For example, when a tanker is destroyed, the resulting explosion has an area of affect, and this is visible as the concussive blast hits others nearby. Explosions are much more impactful now. The sound effects are fitting, and the new voices for the Zuul are also quite fitting. Those guys sound mean and nasty – like they are. When it comes to appropriateness, there is mention of slavery, as the Zuul can enslave other races. They also disregard proper planetary stewardship – they destroy to meet their needs. There is also ship to ship explosions, and planetary bombardment. None of this is graphic. It\'s mostly harmless, though some may prefer to talk with the younger audiences why if we really did find alien life that bombing their planet isn\'t the best idea. I found that with the improvements, it\'s still the same core game. If you don\'t like Sword of the Stars, this is unlikely to change your mind, but for those who are fans, this expansion is highly recommended. Fortunately, GamersGate, Impulse, and others have released not only this expansion, but the Sword of the Stars Complete Collection, which includes this update. GamersGate has this expansion for $14.95, and the whole collection for $29.96, and with two other expansions, the value is obvious. I highly recommend this to space fairing strategy lovers.